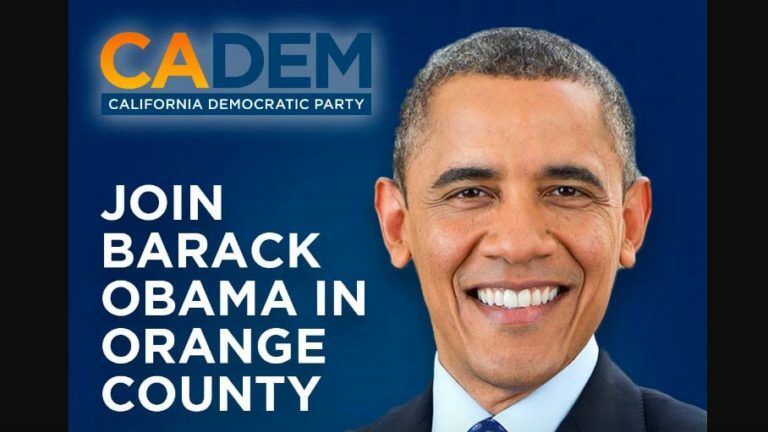 The California Democratic Party is inviting people to seek tickets to Barack Obama rally. Only 750 tickets are said to be available for an “invitation-only” rally Saturday featuring Barack Obama in rare campaign mode. But the California Democratic Party is teasing access to the Anaheim Convention Center appearance by the 44th president. That came amid begging for tickets. Anyone get tickets to see Obama in Anaheim or are we all just going to stand outside and wave at him? Despite media reports that local congressional campaigns would control precious tickets, a representative of 49th District candidate Mike Levin — seeking the Rep. Darrell Issa-vacated seat — said his office didn’t have tix. The Democratic Congressional Campaign Committee didn’t immediately respond to a request for details. Caryn Puma, the spokeswoman, said Saturday’s rally otherwise has no publicly available seats. The demand is potentially huge. In 2012, 512,440 Orange County residents voted for Obama — behind Mitt Romney’s 582,332. The Obama rally on behalf of seven California Democrats, including Levin in North San Diego County, was set to begin at 10 a.m. and last until after 1, according to media reports. It’s set for the 7,560-square-foot Ballroom E on the convention center’s third floor, which has a listed capacity of 756. Outside, at least one group is planning a protest. A unit called “Keep Orange Red” posted an event on Facebook titled “Protest Commies And Obama” at 9 a.m. at the 800 W. Katella Avenue center. According to the Orange County Registrar of Voters Office, Republicans outnumber Democrats in the formerly ultraconservative county 534,027 to 501,950.